A Conservative senator earmarked as one of the Senate's top spenders holds a master’s degree from a school whose phone number directs calls to a customer helpline for a website that sells iPads and printers. 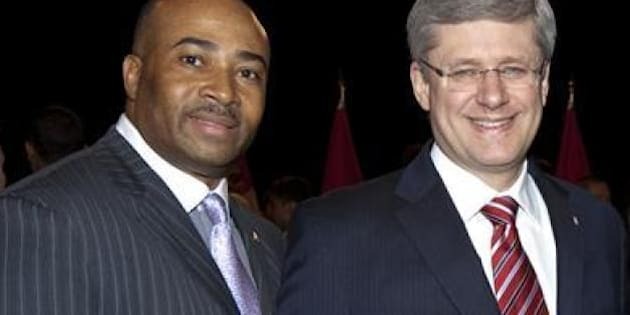 Senator Don Meredith, a Toronto-area Pentecostal pastor, has a master's degree in religious studies from California State Christian University (CSCU) – an unaccredited and unregulated private institution that has shifted addresses at least four times within the last 10 years. It’s an academic claim that has caught the attention of the office of the top Tory in the Senate and triggered a request for Meredith to provide details of his credentials, more than three years after his appointment to the red chamber by Prime Minister Stephen Harper. Meredith also says he has an honorary doctorate from an association of Christian counsellors that has no standing as a degree-granting school. Since receiving this honorary doctorate, Meredith frequently signs his newsletters and press releases as “The Honourable Dr. Don Meredith." The Huffington Post Canada has learned that the leader of the government in the Senate, Senator Claude Carignan, asked Meredith about his credentials in March but Meredith's office refused to produce records of the degrees he lists in his online Senate biography. Carignan would not comment on questions about Meredith’s degrees, citing private “caucus management” reasons. "But when someone tells you they are a doctor in something, well, only doctors can say they are doctors,” he said. Meredith has not responded to multiple requests from HuffPost Canada to comment on the details of his degrees. In 2008, Meredith was chosen as a last-minute Tory candidate to replace international trade lawyer Mark Warner in a federal byelection race for Toronto Centre. Meredith ultimately lost to former Liberal MP Bob Rae. At the time, the biography on his campaign website did not include any post-secondary education degrees. Meredith did attend Ryerson Polytechnical Institute (now Ryerson University), but dropped out in 1994. He was able to add a master’s degree to his resume in the two years between his byelection loss and his Senate appointment in 2010. One of Meredith’s online biographies states he is "an alumnus of the prestigious California State Christian University, where he earned his bachelor's and master's degree in religious studies." The Prime Minister’s Office specifically mentioned Meredith’s master’s degree from CSCU when it announced his appointment as a senator. But the university has never been recognized as a legitimate degree-granting institution by the Association of Theological Schools in the United States and Canada, nor by the state of California since the school was founded in 1972 by a Korean pastor. The school has never been flagged by the Better Business Bureau of Silicon Valley nor has it been red-carded by the state due to its status as a private post-secondary school with religious exemption from government oversight. HuffPost Canada reached out to the school and several graduates to learn more about the program. The only person who replied to our inquiries was Arthur Tolliver, who coaches football at a community college in Buffalo, N.Y.
Logging on from home, a bachelor degree from CSCU cost Tolliver approximately $2,500 in 2003. When he returned in 2005 to pursue a master’s degree, tuition cost him a “little bit more, not much." His fees were inclusive of a round trip to CSCU’s campus in Riverside, Calif., two weeks before graduation to meet professors and write his final examinations. As far as the state of California’s department of consumer affairs is concerned, CSCU’s files have not been updated since 2004 after the school failed to reapply for its exemption status. “They never bothered to do any additional paperwork,” said a representative from the bureau for private and post-secondary education. But the move had minimal repercussions for the school because it was exempted from regulatory checks anyway. The school uses rolling admissions with no application criteria, according to information posted on its website in 2004. Its terms are semestered and lessons are conducted via online correspondence for students who are not in the Los Angeles area. “Each quarter each student is part of a class that focuses solely on the development of their character so that the objective of having Godly competent leaders who can change their worlds for Christ can be achieved,” CSCU president Bob Orr wrote on his blog about the school’s philosophy. In 2012, California lawmakers vowed to crack down on diploma mills after a series of reports singled out the state for issuing the most phony degrees in the country. “The most serious consequences occur when people are hired for positions for which they are not qualified,” testified California State Assemblyman Roger Dickinson during a hearing at the time. Still, despite disappearing from government records 10 years ago, CSCU continued to update its social accounts, and its website is periodically active although it has also been offline for days at a time in recent months. New “extension learning centers” have also been set up in countries including Singapore, Kenya, and Tanzania. Shortly after Meredith became a senator, he began crediting himself with the title “Dr.”, even signing his email newsletters and press releases with “The Honourable Doctor." His biography does not list a PhD or an MD, but it does include an “Honorary Doctor of Divinity degree” awarded by the Canadian Christian Clinical Counsellors’ Association. The association is not a school or educational institution but a registered business, according to Industry Canada. The group’s website indicates it operates the Canadian Christian Clinical Counsellors College, and lists an address in Calgary. The association also lists an address in Ontario in the Industry Canada registry. While several Christian colleges have been accredited by the government in Alberta and Ontario, the Canadian Christian Clinical Counsellors College is not among them. A photo in one of Meredith’s newsletters from 2011 shows him accepting the honorary degree at Crossroads Centre in Burlington, Ontario – better known as the studio for the daily Christian talk show “100 Huntley Street." Since Meredith’s appointment in 2010, he’s been named to and dropped from four standing Senate committees. He was most recently removed from the Senate standing committee on human rights after revelations surfaced in March that he attended the National Prayer Breakfast in Washington, D.C. Meredith had actually been denied authorization for the trip, but he attempted to expense the total tab anyway. The senator reportedly had to cover some of the costs out of his own pocket. “I broke no rules. I did nothing wrong,” explained Meredith in a statement issued three weeks after news of his unapproved trip broke.